Orphaned as a child, Mike Bastian was taken in by the legendary outlaw Ben Curry, and raised and trained to take over his empire of crime. Today, Mike is the quickest draw and the stealthiest tracker around, and Ben Curry is getting ready to retire. To test Mike's wings, he has set him a task: the planning and execution of a gold-train robbery. Now, as he prepares for his first criminal job, Mike must decide whether to follow the path that has been set before him or to carve out a destiny of his own. If he assumes the position of gang leader, he will face deadly competition from within Curry's band, but if he refuses, he may not be allowed to leave the pack alive. The dilemma is further complicated when he falls for Drusilla, Ben Curry's real daughter, who knows nothing of her father's career. Either way Mike chooses, a showdown is in store. ©1949 Best Publications, Inc. Copyright not renewed. 2007 Golden West Literary Agency (P)2007 Blackstone Audio Inc. I enjoyed the book as I always do with Mr. L'Amour's work but the quality of the recording was not up to the standards of the other Blackstone releases. Mr. Gough stumbles, mispronounces words, coughs, and talks to persons off mike, unlike his previous work, and the editors of the recording did not chose to correct the problems. This will not stop me from buying more books, but the editors need to be more alert in the future. The narrator was absolutely terrible. He cleared his throat, coughed and re-read lines too numerous to count. Ruined a possibly good story. I did not like the Narrator, he was horrible, always correcting himself and repeating lines. What disappointed you about The Trail to Peach Meadow Canyon? The narration. I would not hire this man to narrate a first grade reader. Certainly nothing by Jim Grough. What didn’t you like about Jim Gough’s performance? He stammered and stuttered. Repeated lines and could not pronounce several words. Audible has pleased me so far with their quality, but this one has fallen way short. I believe a drunk could read it better. If they take the time to listen to it they will pull it off the list. Don't waste your money on this one. I wasted a credit on this so I'm not pleased. 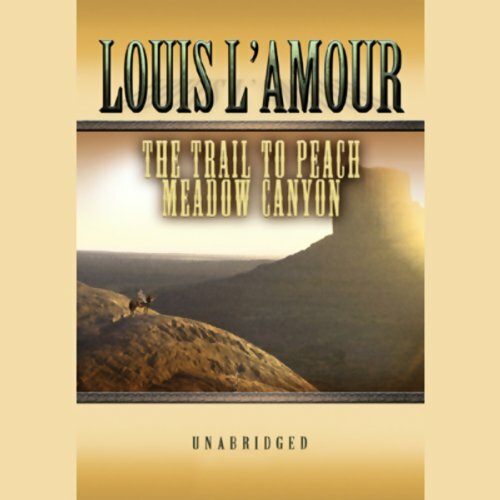 I love Louis L'Amour books and Jim Gough is an outstanding narrator. However, this release is still in rough form with many obvious editing errors such as coughs, comments and re-reads. The same story is available in dramatized version with the title "Son of a Wanted Man" and is very well done.